Above is a small posy I made while I stayed at my mum's house when we made the water feature. It's tiny rosebuds from The Fairy rose, and the first autumn cyclamens. Aren't these little rosebuds the sweetest? I think I'll take a cutting from the bush this summer! Mum was given a bunch of chrysanthemums for her birthday. I made a few bouquets with them and then floated any broken or leftover heads in this bowl, with some more fairy rosebuds. The pink roses are Compassion, and they smell just beautiful. Another cutting I must take this year. 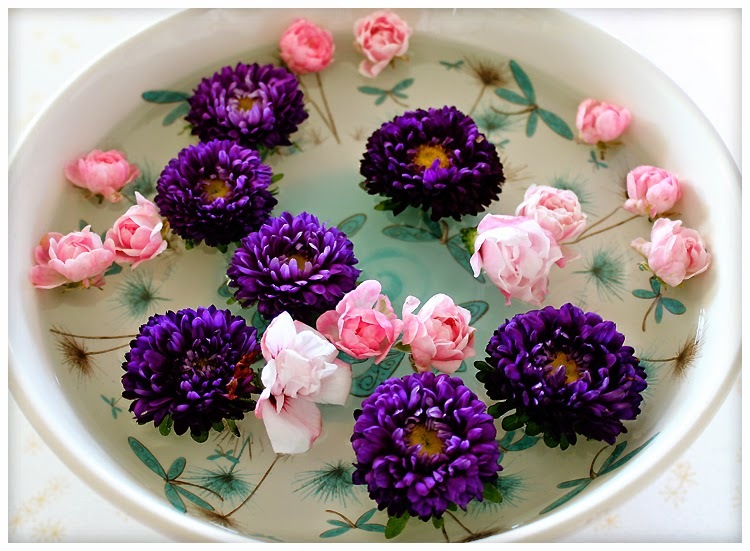 They are paired with some white chrysanthemums, in an amber vase which picks up the warm tones in the roses. 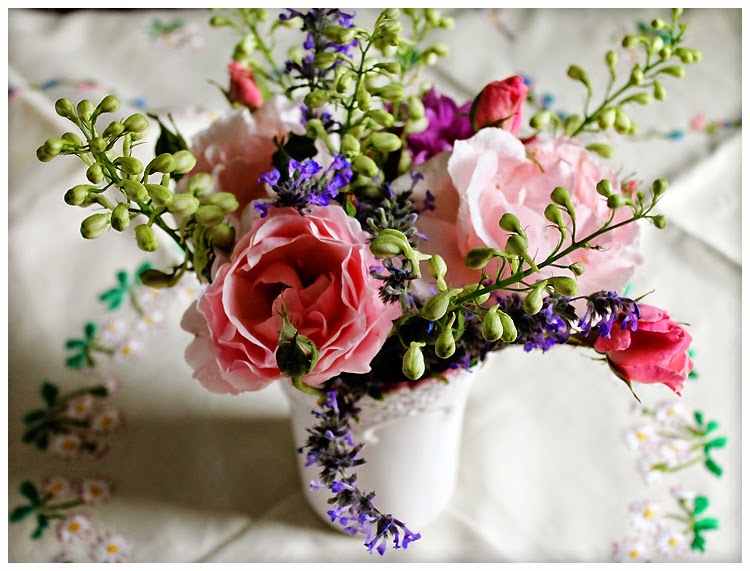 Back at my house, I picked some Queen Elizabeth roses and put them with catmint and delphiniums. 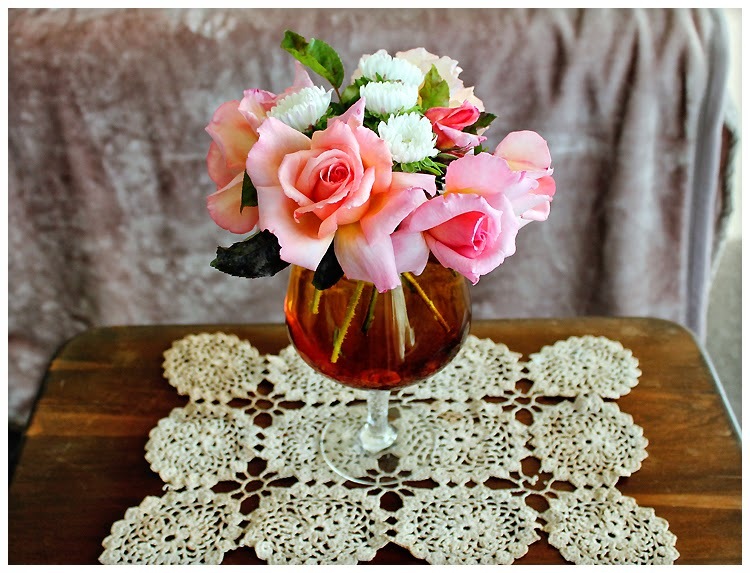 I love this romantic arrangement on a vintage embroidered tablecloth. 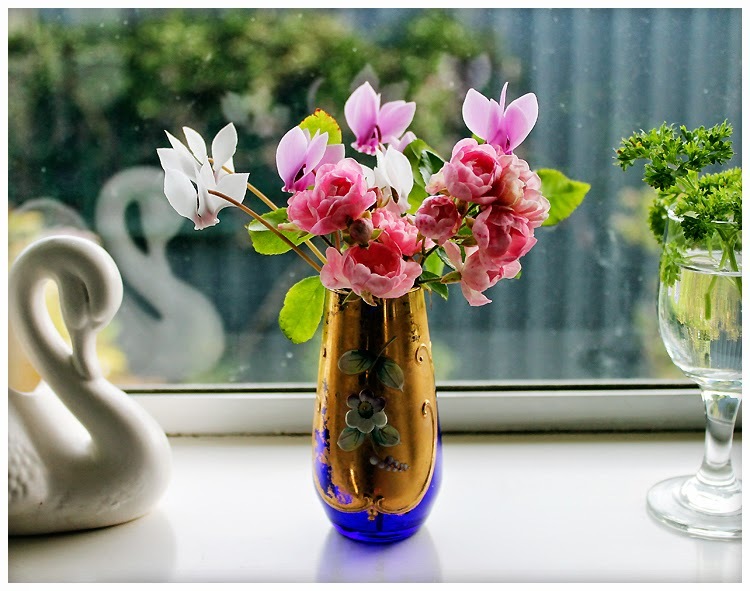 At the end of February was the Ellerslie Flower Show, sadly the last one as it's been cancelled for being too costly and not recouping its costs. This was one of the showstopper gardens. 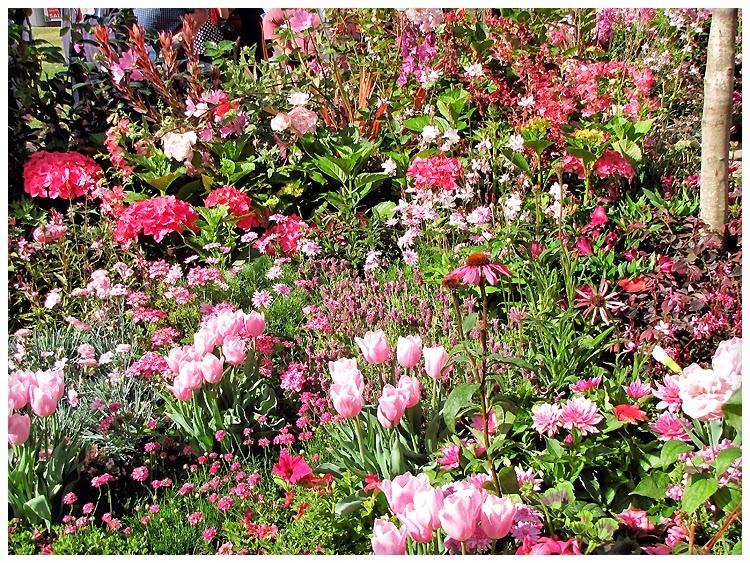 How could I not love it as it's called Passion and is all about pink flowers! There are over 1000 flowering plants here. 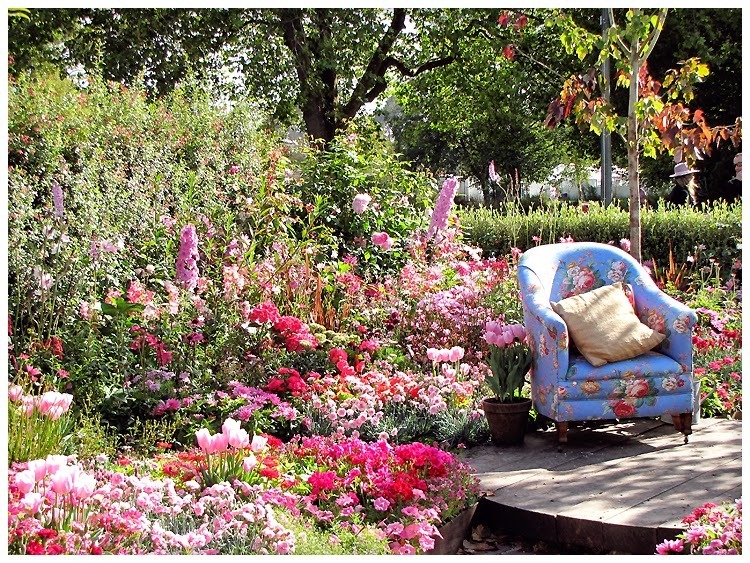 I love how girly and romantic it is, down to the flowered fabric covering the chair! Yes those are tulips mixed in with the late summer plants. I overheard some people talking about it and apparently the designer forced all those bulbs to get them to bloom at such an unusual time. They look beautiful... not something you can really do at home, but the rest of the planting is quite inspiring. It was really nice to see a garden that was all about the flowers, rather than hard landscaping! Well I've had a nice little walk through summer in my pictures. Now I'll cuddle up under my blanket again and wiggle my toes in their thick fluffy socks. Mr Lui is snoring beside me and we're both counting down the days until it's summer again! I loved your rosebuds, they are so cute! I wish you could come and visit my garden right now and recharge your batteries, we are having an amazing summer for the second year in a row and my garden is bursting with flowers. Wishing you a great week! I really fall in love with every single flower arrangement you've made... And the garden is also amazing.. Love it.. 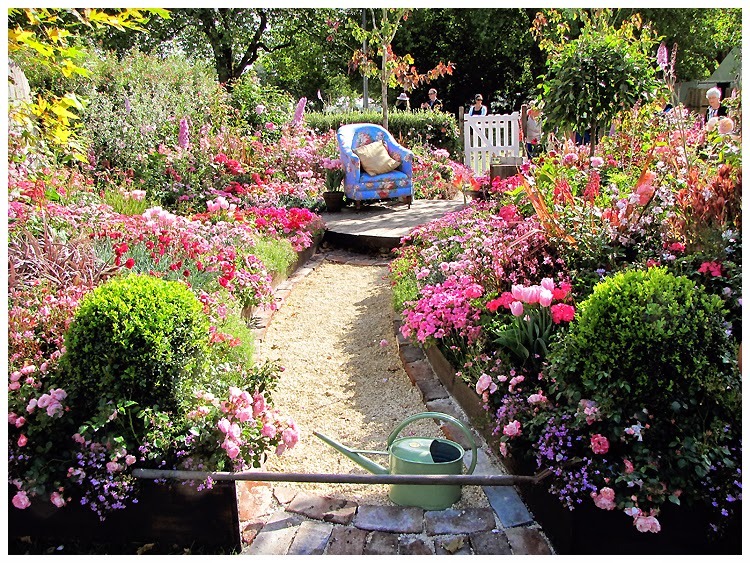 Thanks Hari, I'd quite like to live in that pink garden!